We’ve been ridiculously time-poor lately, to the point where the blog is a couple of months behind. Looking back, however, we actually managed to squeeze a fair bit of farm stuff into that couple of months. I’m going to summarize that time by listing the many, many, many things we learned. 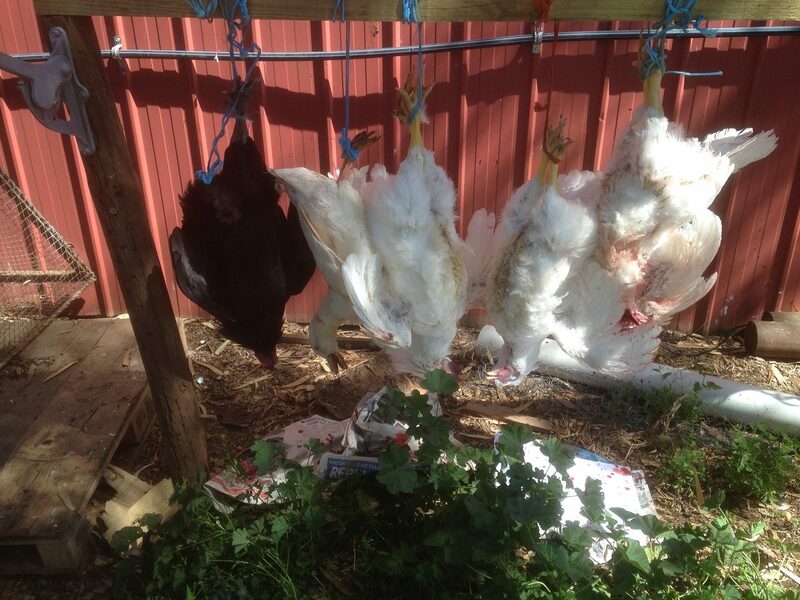 Chooks – breeding them and eating them. 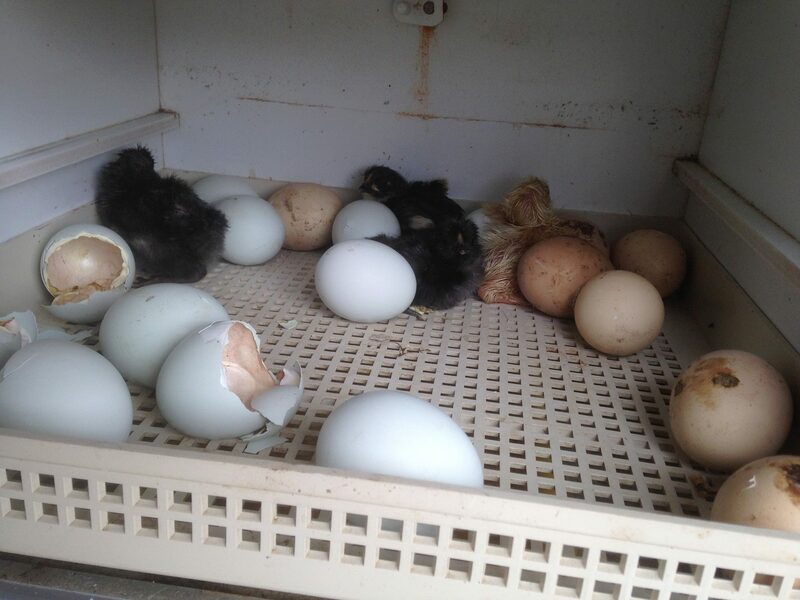 We hatched a couple of batches of chooks – both ours and a friend’s. Our hatch rate is good, but we’re losing the babies after the fact. I think we made a couple of mistakes, including putting them out in the brooder too soon when it was a cold night, swapping them to grain too early, and having too many in our larger A-frame brooder. Even with those mistakes we still have a heap of young ones on their way up. Now we need to have room to keep them. Along those lines, we created our 5th poultry area around that time, putting some egg ducks around the side near Farmer John’s place. 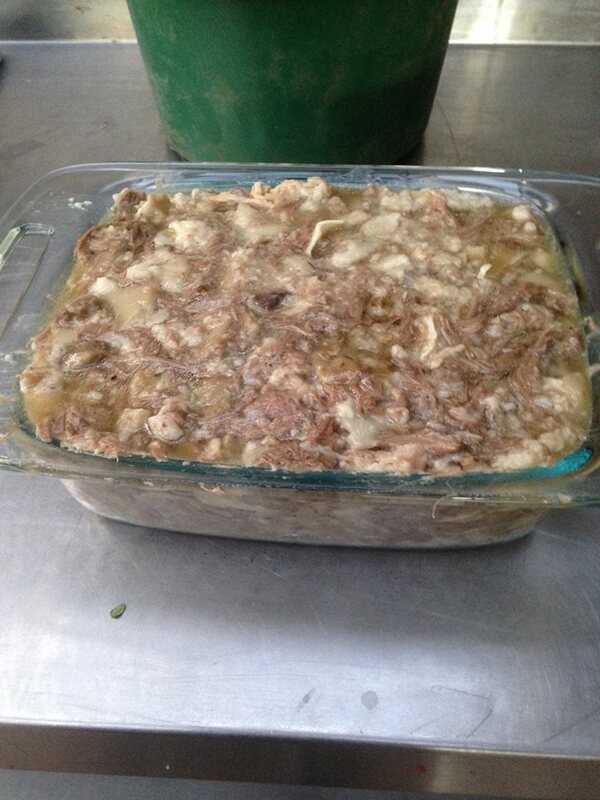 We processed a couple of batches of chooks, and both went well. The new neck-breaker works very well, though you have to be aware that the birds do still flap around which can be disconcerting if you’re not ready for it. The automatic plucker works a treat if kept down to 2 or 3 birds. In theory it can take a half-dozen, but that doesn’t work well. 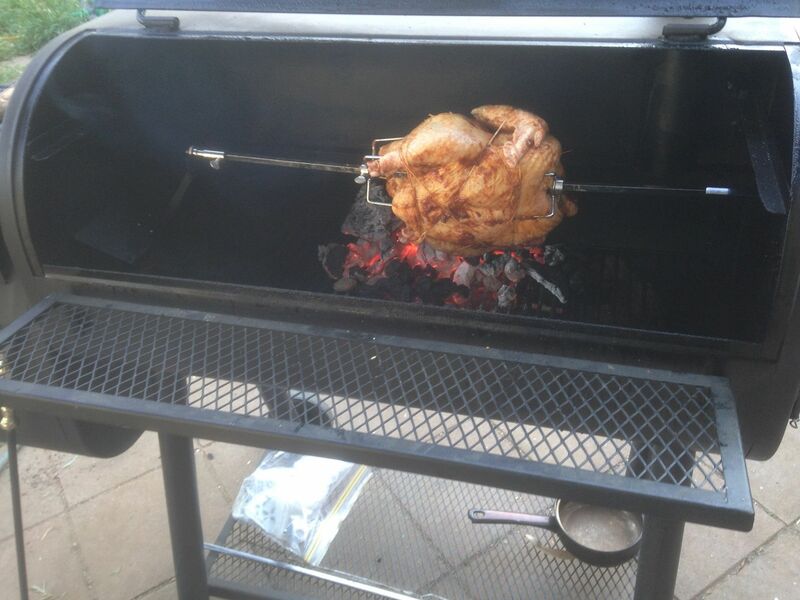 The other thing we know for a fact is that “dual purpose” birds aren’t always great for meat, particularly not roasting. Our Australorps and Australorp cross roosters are lean and dark. 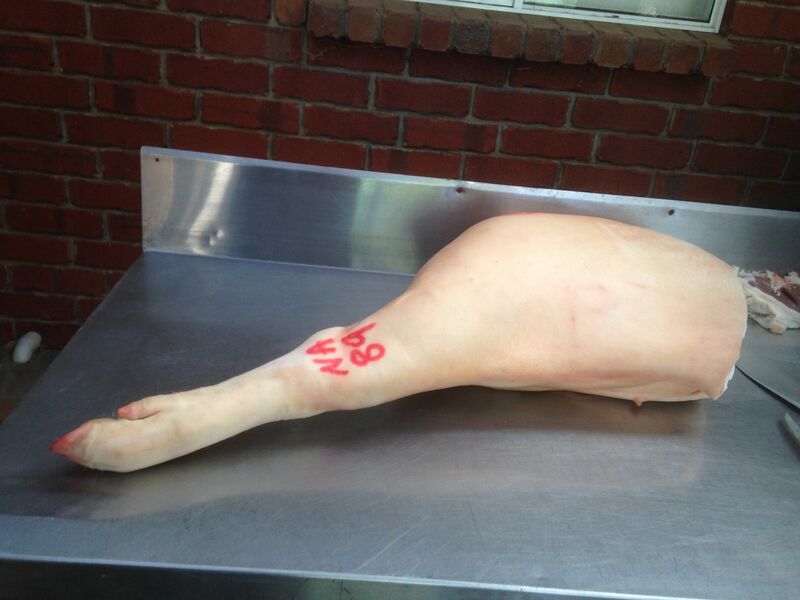 The meat is great for soups, stock, and slow cooking, but really no good for roasting. The Cobbs, on the other hand, are amazing roasters, as evidenced by the layer of fat in them. 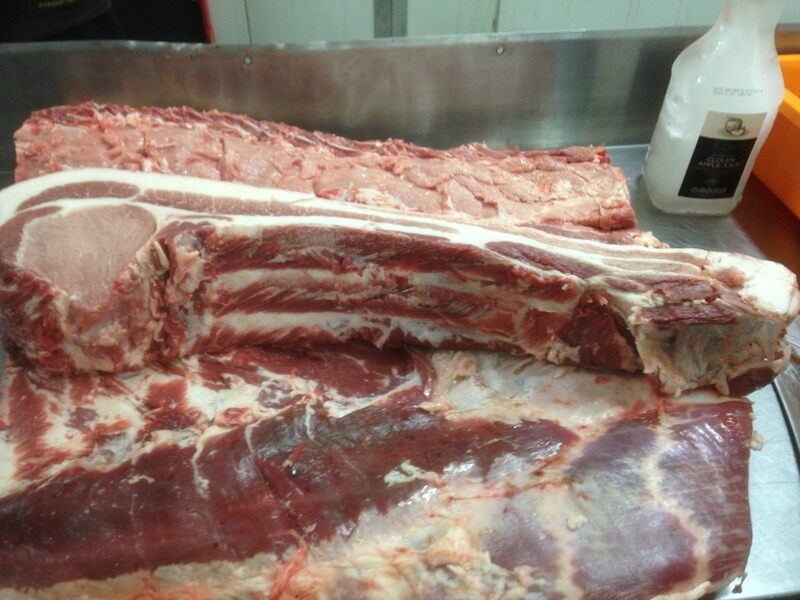 That layer of fat is why the Cobbs roast so well. This just demonstrates to me that we need to push forward with our plans to make our own cross-bred dual purpose bird. I want one that leans heavily towards meat. I don’t care if the birds give us only 150 eggs a year – I’ll keep 30 of them if I need to. I just want babies I can raise as nice, fat roasters. The other thing we learned is that the automatic plucker may not be great for ducks. The one duck we processed just seemed to fluff up in the plucker. We’ll try the Muscovy ducks we have, which are actually geese, and see how they go. If push comes to shove, we can always just skin them. Pigs – also breeding and eating them. Honey Pig had 13 babies at the start of September. All were born live, but two were definitely on the edge and neither made it the night. The big thing we learned here is that mumma pigs will clean up the dead babies if left to it. That worried me at first, but research showed that it’s a natural instinct. Gross, but natural. 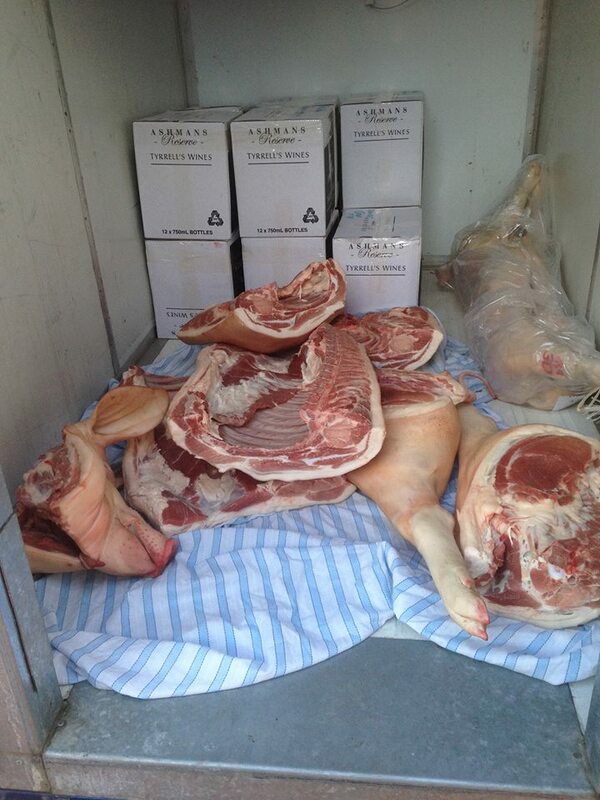 We took a couple of batches of pigs to “The Other Farm” over this time period. The first included Bertha, our first teenage pregnancy, who was the star of our own pig-in-a-day. She was planned to be a baconer for us and some friends some months earlier when we discovered she was pregnant. It didn’t save her though, as she was a terrible mum and really seemed to like busting fences. Bertha! 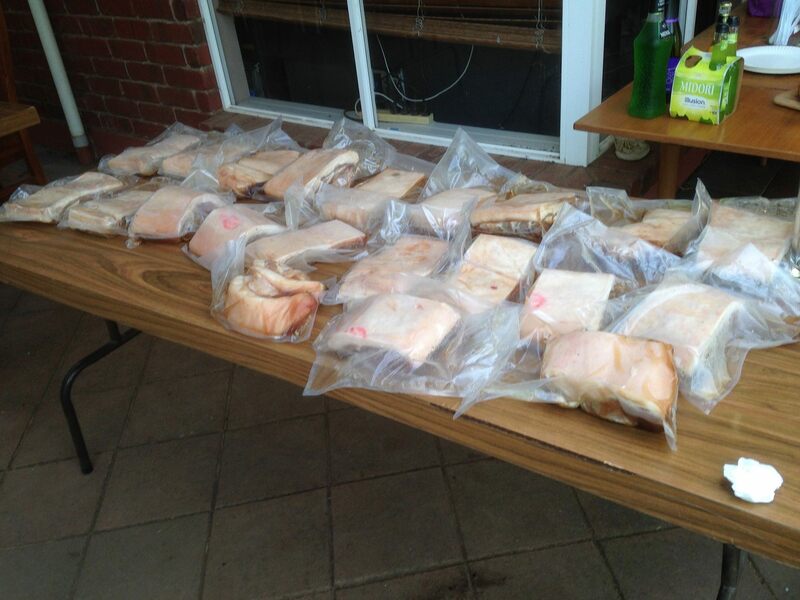 You don’t realize just how much meat 90kg is until you have to deal with it. Bertha dressed out to 89 kilograms, and was the perfect size with the perfect amount of fat for what we were after. 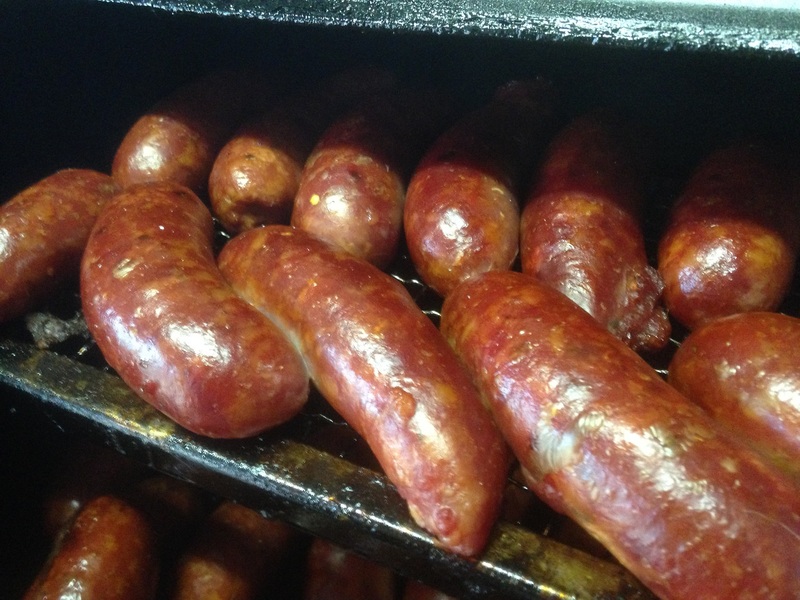 We experimented more with bacon and sausages, and it worked out well. We need to play with both quite a bit more, but the results are invariably fantastic. 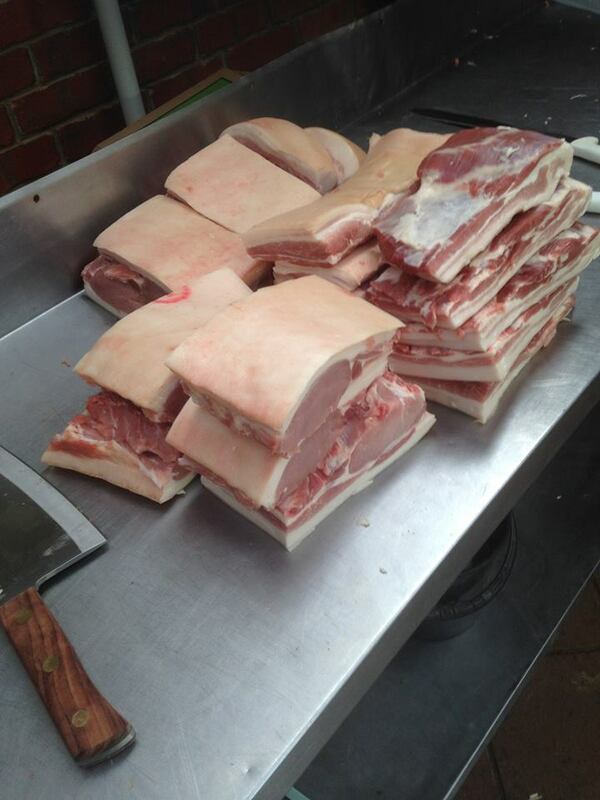 Belly and loin cuts ready to be baconed! 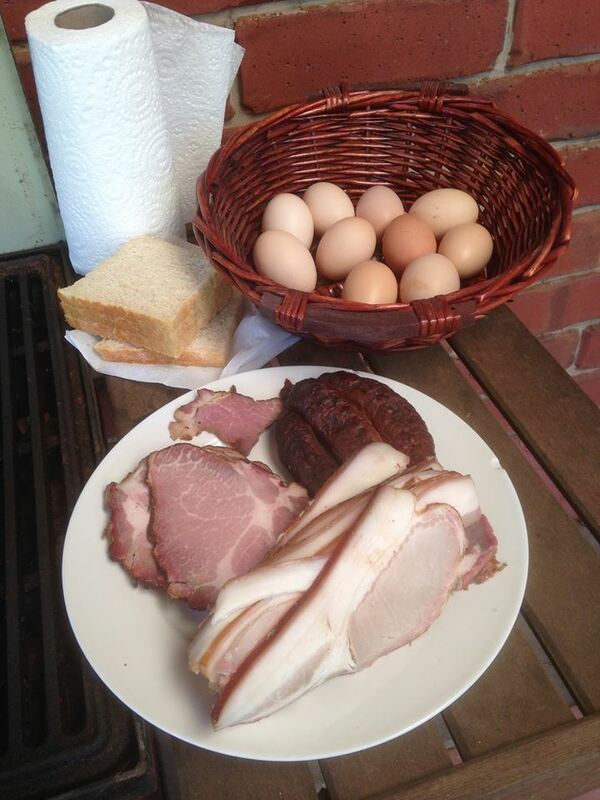 With the exception of the bread, this is a fully home-grown, home-made breakfast! 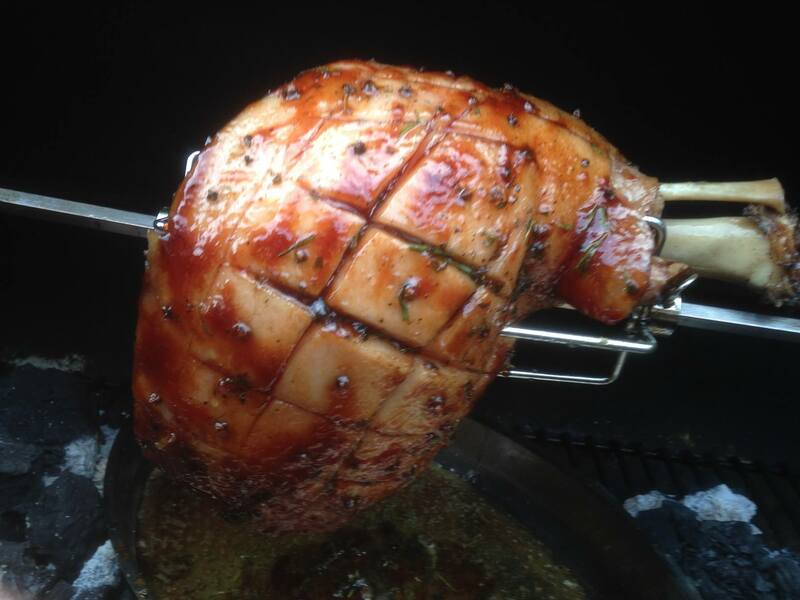 We also tried our first hams from Bertha. Linhda put down 2 wet-cured hams, and they both turned out well. Again, we need to play with the recipes a bit, but the results were delicious. After curing we smoked the hams and then baked them. We’re still a ways from air-dried ham. The other thing I’m determined to get right and to make a staple is brawn. I started making it to ensure that we used the entire animal, and was mildly surprised that it was so tasty. 🙂 This time I think we got it almost right. The only thing I want to do is increase the spice a bit. 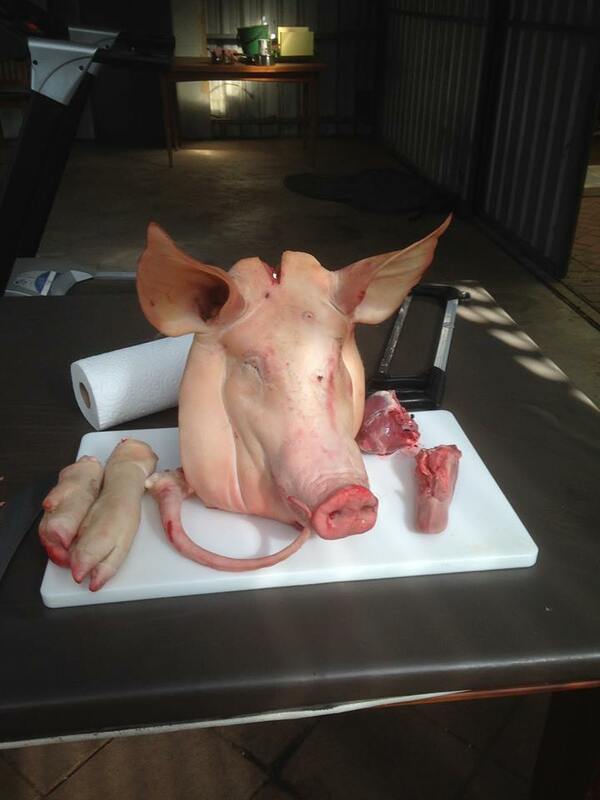 Bertha Brawn ingredients – head, trotters, heart, and tongue. Meat, fat, skin all stripped off. 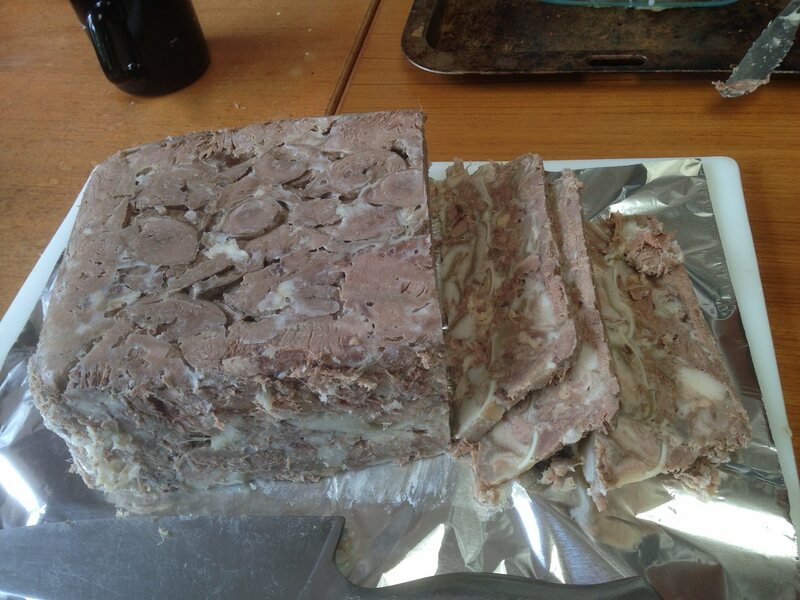 Put into a container, pressed in firmly, with a little bit of aspic on top. And the results were perfect! 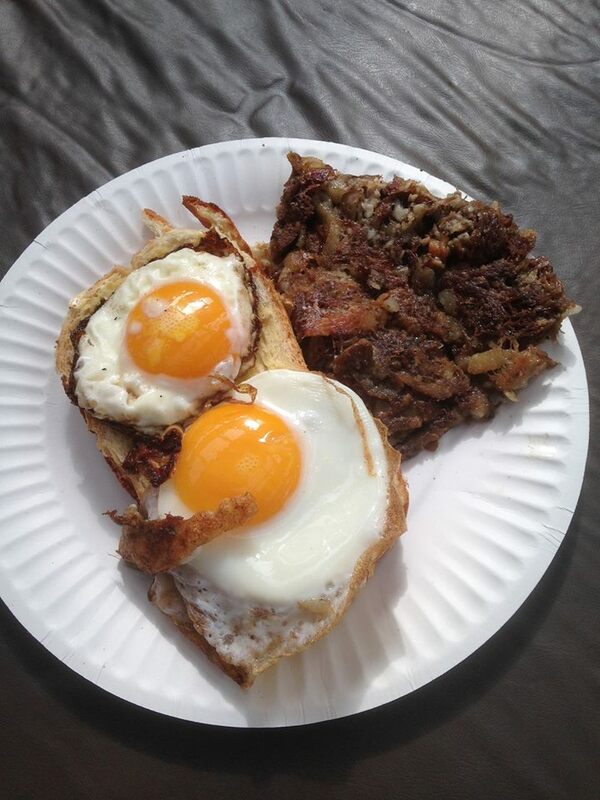 My favourite way to eat brawn – frying it removes most of the grease and it crisps up beautifully. 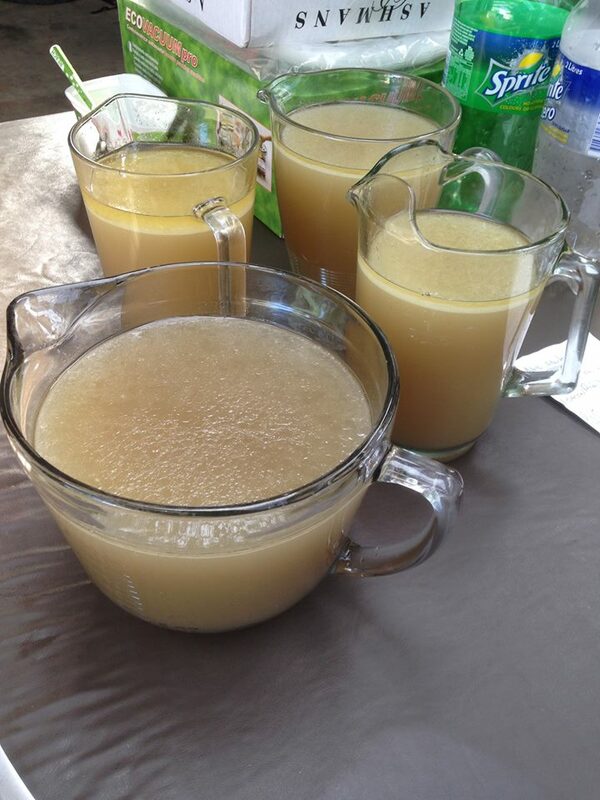 We also made stock, which is standard now for this kind of activity. I bang on about how good home-made stock is, and how you can’t really know the difference until you try it. Seriously though, it is amazing. 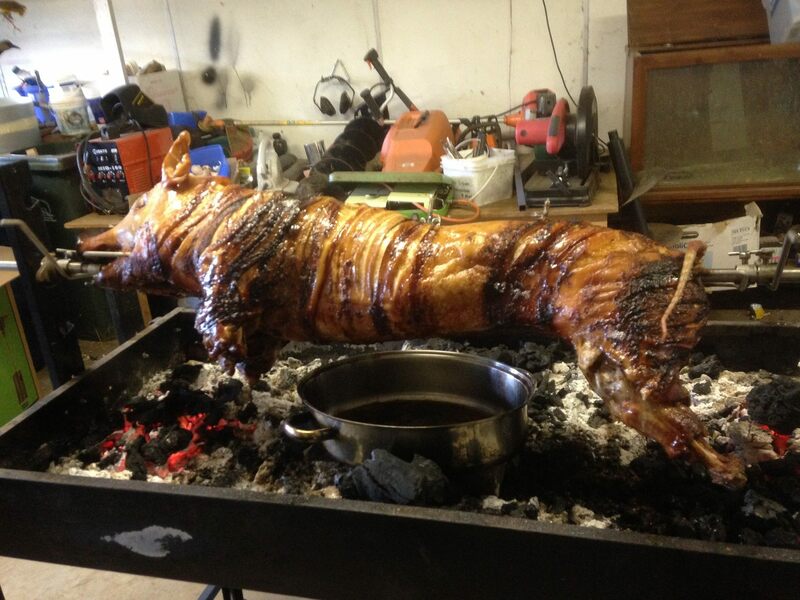 We also had the obligatory spit-pig. 🙂 This one was for Gemma’s 18th birthday party. We’re getting better with the spit-pigs, but it’s still more art than science. We also took one of our original sows to “The Other Farm”. This was huge for us, and for me personally. My end-game with our little hobby farm was always to get pigs, and that started with two sisters and their brother – Honey, Smoked, and Ham. Ham ended up in our freezer within 5 months or so, and the two sisters were our first breeders. While Honey had just had her 3rd litter, Smoked couldn’t get pregnant after her first. She was in with Boris through 5 or 6 consecutive heat cycles, and while they certainly mated, she wasn’t getting pregnant. In these cases the small-holder faces a difficult choice. Well, difficult if you love your pigs the way I love mine. 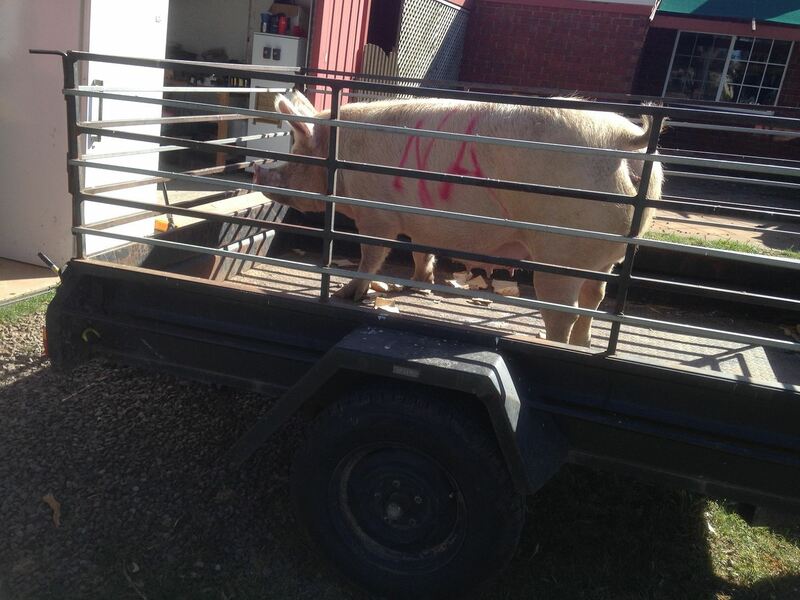 A quarter-ton sow isn’t a pet, no matter how much you interact with them. If she’s given you many litters and you have the space, then you can give her some slack and I’d never begrudge the food it would take to let her live her days out in peace. However, when she’s young, given you one smallish litter, and has many unproductive years ahead of her, the practical choice is to make her a “chopper”. I saw this as a big test for us, and again, for me personally. As hard a decision as it was, I think it was the right one, and we shared Smoked Pig with 3 other couples. 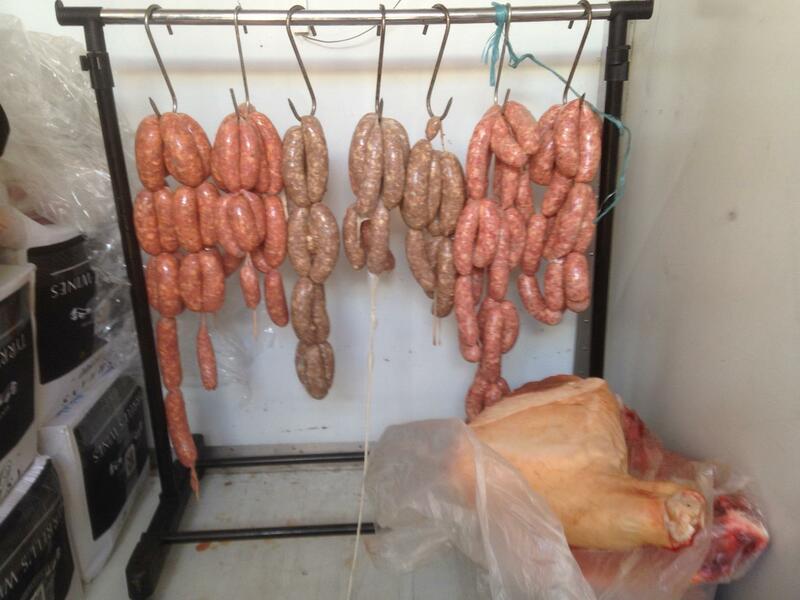 We spent an entire weekend processing her 170kg dressed weight, making bacon, sausages, brawn, and stock. That’s from Smoked. They looked like dinosaur bones! The mince and sausages from Smoked were amazing. I think the bacon left a little to be desired, though the other couples loved it. I think that the denser, slightly less fatty meat just didn’t take the cure as well. 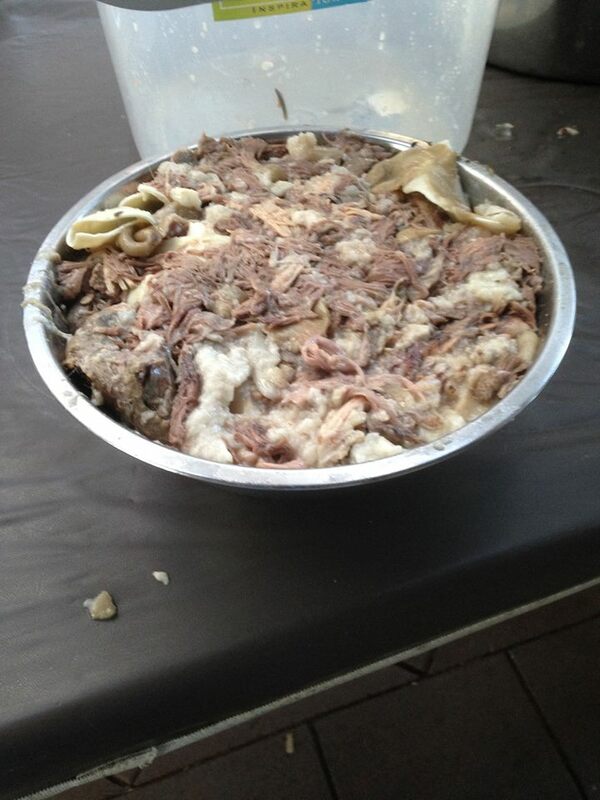 I think next time we’ll process the entire carcass into mince and sausages. The brawn from Smoked was particularly good. The best part about that, however, was making it with friends. 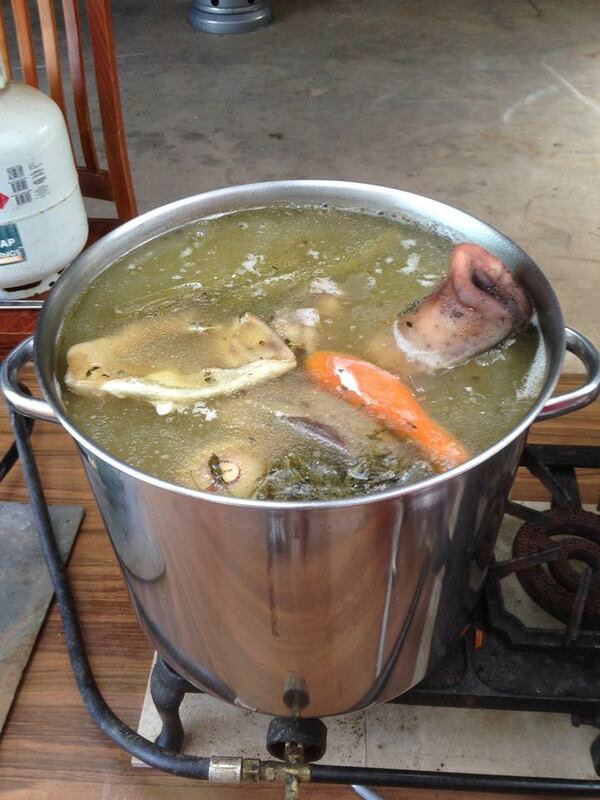 I got to demonstrate full use of the carcass to people who otherwise wouldn’t consider making that kind of dish. It went down well, and everybody had greasy fun making it. Over this time period we took 7 or 8 porkers to “The Other Farm”. We changed up the timing of this a bit, and the results are great. Rather than taking them at the 5 or 6 month mark, we fed some on to 7 or 8 months. This puts them at around the 70kg mark, and I think we’ll get them a little bigger once we change around some feed mixes. There isn’t any more fat, and the prime cuts are just a little bigger. I think we’ll end up feeding all of our porkers on to this stage. The last pig activity for this period was putting a couple into The Patch after most of the veggies were harvested. I think we’ll end up changing the veggie patch location, and will end up using chickens in the rotation rather than pigs. Still, having pigs in there is pretty cool, and they certainly have a blast. 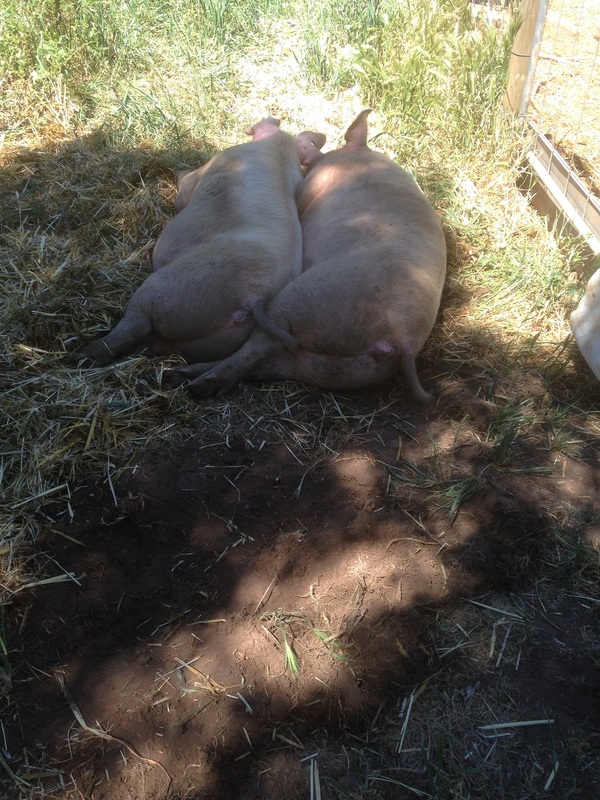 Two of our sows spooning after spending the day eating their way through my veggie patch. 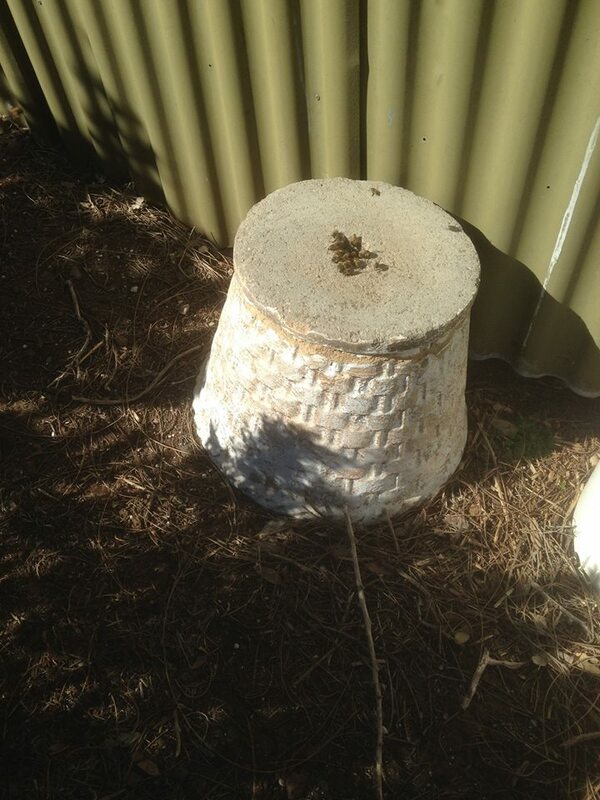 We managed to find an amateur apiarist to come help with our bee hive. Coincidentally, our hive split the day before he was due, the swarm taking up residence only 10 feet from the hive. The apiarist was able to catch this swarm and keep it, which was great. 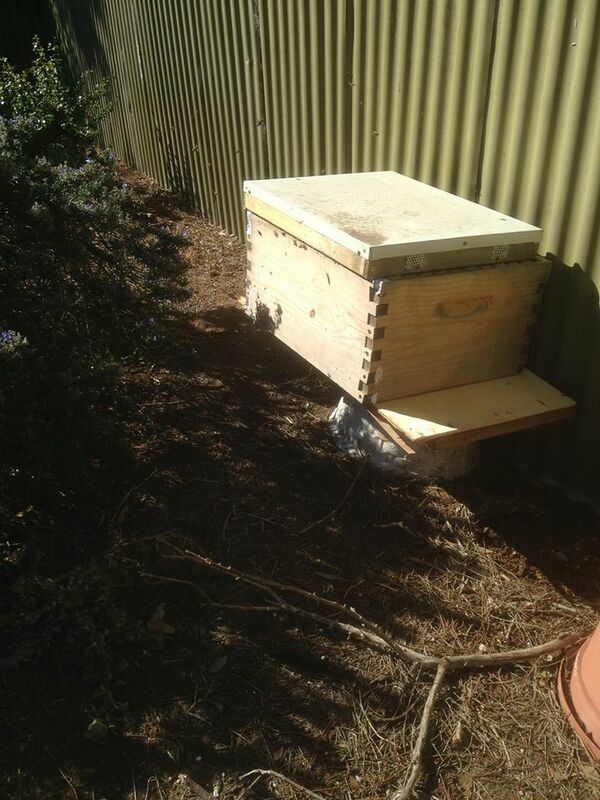 We fixed up my hive – putting in a third super and fixing up the brooder box, which actually fell to pieces when we picked it up. The big lesson learned here is that I need a proper bee keeping suit. The apiarist had on overalls and a professional suit, and he got stung once. I had on a home-made contraption, and I got stung. A lot. Mostly on the stomach. It wasn’t awesome. A swarm in a concrete planter. They must’ve been there for a little while, because that planter is FULL! 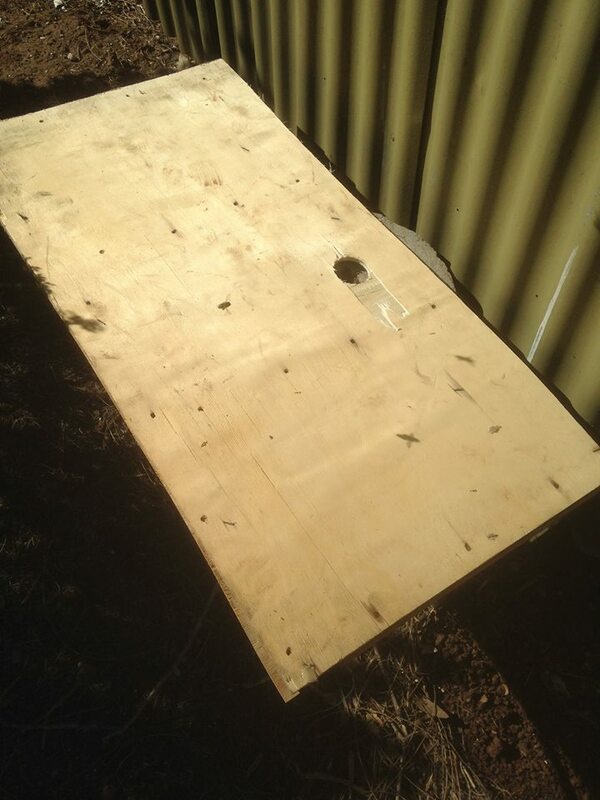 Step 1 – put down a base that’ll support a super. September and October were surprisingly productive, especially when you consider the dozen or so pigs we had processed. Our next challenge is to find more land, preferably over 40 acres, and see if we can increase our operation. Wish us luck. 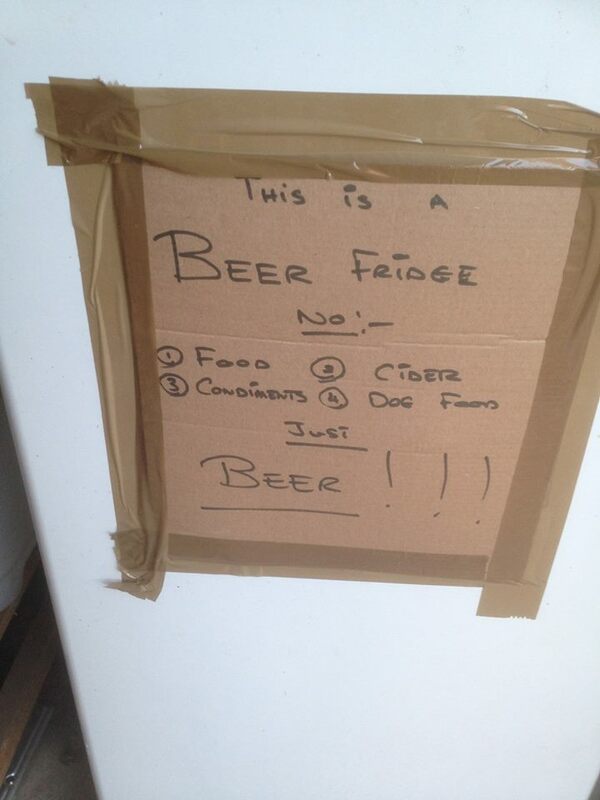 Apparently dad is sick of the beer fridge being abused. 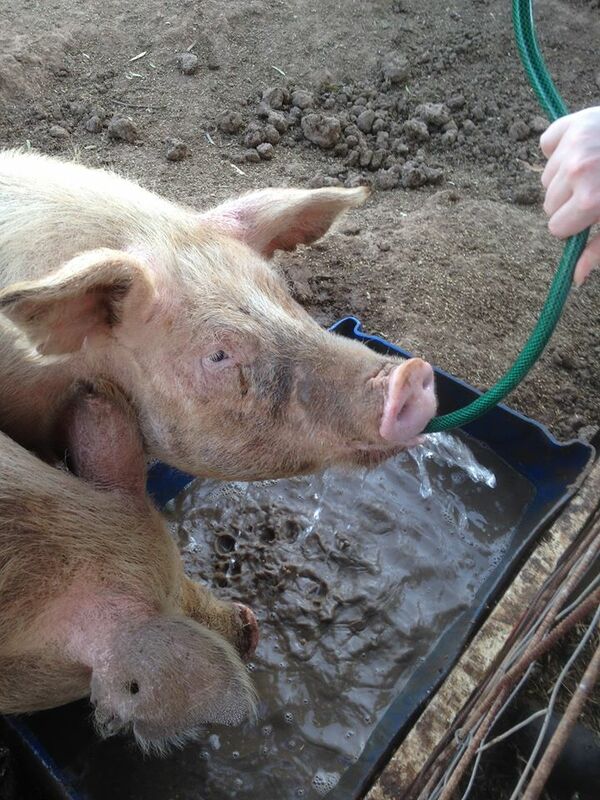 Ziggy Pig LOVES to drink from the hose.